Acupuncture is one of the oldest, most commonly used medical procedures in the world. It originated in China more than 3,000 years ago. Acupuncture is the gentle insertion of very fine needles at specific points on the body. This process stimulates movement of energy within the body, allowing natural healing to take place. Treating existing illnesses or injuries. Acupressure massage therapy stimulates and activates the body’s own energies to help fight illness and restore harmony. Based on the principles of acupuncture, acupressure involves the use of finger pressure (without the needles) on specific points along the body. Cupping is a technique that is especially useful in the treatment of problems of local Qi or blood stagnation in the Meridians. A cup is applied to the skin and the pressure inside the cup is reduced thereby creating a small vacuum which suctions out air, so that the skin and superficial muscle layer is drawn into and held inside the cup. In some cases, the cup may be moved while the suction of skin is active, causing a regional pulling of the skin and muscle. By creating suction and negative pressure, massage cupping is used to release and drain excess fluids and toxins; stimulate the peripheral nervous system; bring blood flow to stagnant muscles and skin; and loosen adhesions, connective tissue and stubborn soft tissue knots. Auricular Acupuncture is a specialized diagnostic and treatment method. It is a microcosm of the macrocosm: the ear represents the entire body. Auricular acupuncture works by stimulating specific acupuncture points on the external ear which represents various organs and meridians in the body. Special ear needles are inserted into the ear or tiny seeds are taped to the ear to stimulate these auricular acupoints. Auricular acupuncture is effective for pain, stress, high blood pressure, smoking cessation, and many other problems. 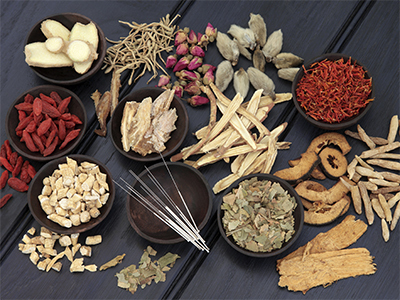 CHINESE HERBAL MEDICINE is integral to Chinese medicine. There are thousands of herbs in the Chinese pharmacopoeia. These may be roots, stems, flowers, leaves and bark, together with some non-plant ingredients. Each herb in a formula is carefully chosen based on its effects according to ancient and modern Chinese texts. Chinese herbal medicine may be used alone or in conjunction with other therapies, but herbal formulas are most often used to enhance and continue the positive effects of acupuncture between treatments. Some formulas on which individual prescriptions are based date back thousands of years. The accumulated experience with these formulas has helped to clarify how the herbs work and when to use them. No matter the form of administration, herbal formulas are carefully balanced recipes of several different herbs that are specifically tailored for each person’s entire health condition or constitution. Each herb is chosen for its own specific functions. In addition, herbs can enhance the strengths and reduce the side effects of each other. The combination of herbs in a formula creates a new therapeutic agent that can treat much more effectively and completely than that of a single herb or western drug. At Meridian Therapeutics, we save our patients the trouble of preparing liquid decoctions strained from boiling raw herbs together, by providing a combination of effective, yet easy-to-use pills, liquid extracts, and granules. Pills come from a decoction of bulk herbs that is boiled, leaving a powder that is rolled (usually with honey) into easy-to-store pills. Liquid extracts are made by combining the raw bulk herbs, boiling them to extract the active ingredients and suspending them in alcohol. Extracts are one of the most potent and most effective forms of herbal medicine. Granules are made by taking the powder from the herbal formula preparation with the water boiled away and mixing that in starch to form granules. Granules can be taken mixed with water or in a capsule. The form that your herbal formula comes in will depend on your diagnosis and the severity of your symptoms. For acute conditions, either liquid extracts or granules will be prescribed because it is faster and easier for your body to absorb these forms. For long term chronic conditions, prescriptions in pill form are given because of their lower cost and milder action. 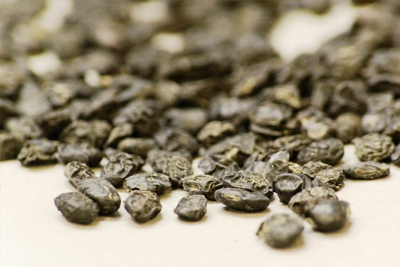 One of the most appealing qualities of Chinese Herbal Medicine is the low risk of adverse reactions or side effects. Herbal medicine uses all the constituents of the plant, including the cellulose. The herb is completely balanced, and therefore has minimal side effects. Though very rare, the most commonly reported adverse reaction is simply minor gastrointestinal upset. Modifying the herbal formula or adding herbs to strengthen the digestive system can remedy this.